posted on May. 22, 2018, at 1:00 p.m.
On a rainy Friday night in Washington, N.J., Nicole Banfield chose her dream kitchen and bathroom with support from her daughter, Sage, and other family members who’d gathered to cheer on the winning designs. 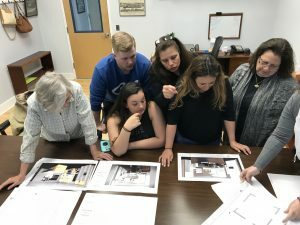 The National Kitchen & Bath Association partnered with Warren County Habitat for Humanity for its annual Student Design Competition this year. The designs of six students — three each for kitchen and bath — were culled from nearly 300 entries, and the Banfields chose the winning designs from among these finalists. The designs will be incorporated into the house, which is in the building process. The self-proclaimed selection committee pored over the plans, spread out on a table at Habitat’s Warren County headquarters. Banfield carefully considered all the options while Mary Trubek of Mary Trubek Architects, who oversees the project design, supplied technical information about each design. Judges for the 2018 Student Design Competition included Danielle Burger, CKBD, owner of Kitchen Vitality Design, Charlotte, N.C.; Mac Dodge Junker, CKBD, The Kitchen Specialist, Durham, N.C., and Mark Haddad, CKBD, Interiology Design Co., Watertown, Mass. They said that many of the entries were as “professional” as the students can make them, considering their experience to this point in their training, but a few really stood out. “They really packed a lot into the space,” said Haddad. The Banfields certainly felt that “wow” factor. Without the benefit of a client profile for a reference, the students were charged with creating a kitchen with seating for four to six people within a budget of $16,000, and a bathroom with a budget of $4,000. The students knew the parameters of the space, and needed to specify surfaces by Wilsonart — the sponsor of the competition — but beyond those requirements, the creativity and ingenuity was left up to the aspiring designers. Banfield said the winning designs managed to include some of the family’s ideal “wants” — for instance, a spacious, inviting kitchen that would inspire people to hang out, and she liked the idea of her own bathroom. Jasmine Dorman, a second-year student at Spokane Falls Community College in Spokane, Wash., and a member of NKBA’s Palouse Chapter, won the first-place design for Banfield’s soon-to-be kitchen. She said she researched the most popular kitchen styles being built in New Jersey, and she created what she thought someone would like. It should be noted that Spokane Falls was not previously accredited in NKBA’s former accreditation program, although it is currently an affiliated school. Producing a winner is a testament to the quality of the program. “After seeing current trends and things coming from KBIS, and lot of kitchens being built in New Jersey in the farmhouse style, I felt like any person would love to have that kind of style in their kitchen,” Dorman said. Real-life experience came into play in the selection of the bathroom, which was designed as a bath-and-a-half. Kelly Writer, a student in Arapahoe Community College’s kitchen and bath program in Littleton, Colo., designed the first-place bathroom. Writer’s first vocation is as a graphic designer, but she went back to school to pursue interior design as a second career. She wanted to create a space that satisfied the needs of the children, but also gave Banfield her own peaceful space. As a mom herself, Writer appreciated the value of this feature. So far, Banfield has also picked out the siding and the roof for her new home. She is happy to have contributed to the success of the students who entered their designs to give her functional spaces. So far, the foundation for the single-story home is dug. Framing will potentially begin in June, and Banfield is ready to put in more of her required 250 hours of “sweat equity,” which is part of the deal when a family is selected to receive a Habitat home.